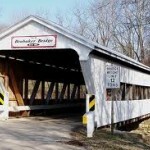 Gratis is located in the southwestern part of the state in Preble County. It has a population of about 1,000 residents. 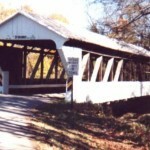 The bridge is located near Enterprise Road on Fudge Road in Gratis. 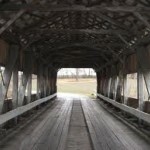 It spans Sams Run Creek Brubaker Bridge is within one mile of the Cry Baby Bridge along this road. 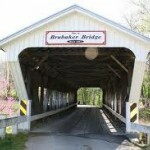 Leave Gratis on Route 122 heading west and then turn left onto Township Road 328 to find Brubaker Bridge. Locals claim that a group of 13 teens were going to a party one night in the 1930’s. They were on their way to Grange Hall in Gratis and they were going too fast when they hit a curve in the road. They hit the side of the Brubaker Bridge. Twelve of their bodies were later discovered by a rancher who was checking on his livestock in the middle of the night. The body of one of the teens was never found. Check out the Jetmore Curve in Jetmore, Kansas or Smitty’s Curve in Geneva, Nebraska. 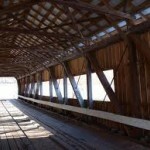 Interestingly, the story told about this haunted location is remarkably similar. 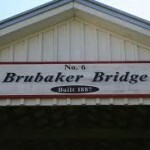 The Brubaker Bridge is a covered bridge that was constructed in 1877. Gratis locals claim that anyone who parks on the bridge will hear tapping sounds and hissing noises. These are attributed to the boy whose body was never found. Some people have also reported seeing shadow people at this location. Albert Kircoffe Elementary is an old abandoned school in Gratis, Ohio that is said to be haunted.